You’ve heard the hype by now… “sitting is the new smoking” and there is a new disease being coined called “sitting disease.” What is a 21st century human to do? Never sit down? Not very practical, indeed. However, when you understand why it’s important to sit properly and how to sit properly, you’ll find it easy to care for your spine. 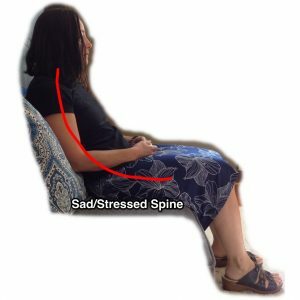 Our human frames were not meant to sit as the primary position we do and our frames are definitely not happy when we sit slouched. Our hips’ design is more conducive to standing, squatting, and lying down, not sitting. The fact that our hip joints are ball-and-socket joints mean that they are meant to move around in big motions that are multi-planar, similar to moving your shoulder in a big circle. Our hips can do that, too, and moving the hips in many different directions instead of just forward and back, as is done with walking and sitting, is optimal for maintaining the health of the hip joints. 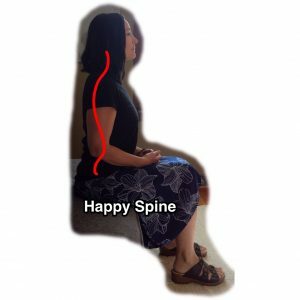 As for the spine, it also is quite unhappy in seated and slouched positions, mainly due to the abnormal stress placed on the discs of the neck and lower back when the normal curves are not there. From the side view of your body, you want a curvy spine with the neck and lower back curves’ convexities going forward. When you slouch, the entire spine becomes a giant “C” curve causing huge, abnormal stress on lower cervical and lower lumbar discs. This results in accelerated “wear and tear” on the discs. Guess what the number one cause of disc herniations is? Degenerative changes over time from abnormal wear and tear! Disc herniations more often arise from slow wear and tear with generally one small trauma being the “straw that breaks the camel’s back” than from one, dramatic injury. So, my first tip is to simply minimize the amount of time you spend sitting. Stand, walk, squat, or lay down, preferably on your side. Love to watch tv and relax at night? Well, lay on your side to do it. If you lay on your back, do not prop your head up on anything because that will reduce your protective neck curve and put stress on the lower cervical spine and nervous system. When laying on your side, support your neck in order to keep your neck and back in one line and bring your chin up away from your chest, to preserve the proper neck curve. This side lying position is also great for those of you who enjoy reading in bed. Most people have heard of standing work stations by now. Could you get yourself one of these (or make one – it’s easy)? Preferably, you want to be able to sit sometimes and stand sometimes. Make it adjustable to those two positions. When you do need to sit, actually put thought into how you do it. Utilize the backs of chairs that support the lumbar curve. Put a cushion or rolled up towel into the small of your back. The cushion or towel being there will help to support the lumbar curve even when you forget to sit up straight. Lift your chin up to a neutral position. Neutral may actually feel like “stuck up snob” position if you are used to having your chin down towards your chest all the time. Believe me, you won’t look stuck up, just much nicer than everyone seeing the top of your head instead of your beautiful face. Don’t let “Sitting Disease” be something you could ever hear uttered in relation to you. Take these two steps to sit less and sit intentionally. Simple. Easy. Effective. A happy spine is a good thing for your health!